WOOSTER, Ohio — Honeybees are negatively impacted by the insecticide-coated seeds of some field crops, yet they also seem to benefit from the presence of other field crops in the vicinity of their hives, according to research conducted by entomologists with the College of Food, Agricultural, and Environmental Sciences at The Ohio State University. “Most corn seeds planted today are coated with insecticides. During the planting process, some of that coating is chipped off and the dust is released into the air and also lands on nearby flowers and trees,” said Reed Johnson, an assistant professor in the Department of Entomology. Honeybees and other pollinators are crucial to agriculture and food security. They pollinate about one-third of the crops we eat, valued at more than $14 billion annually in the United States. Johnson and colleagues have studied the potential impact that such release of insecticidal dust during corn planting may have on honeybees. They found that bees do become exposed to the chemicals in several ways. Once bees pick up the insecticide, they carry it back to their hives, where young members of the colony become exposed to it, Johnson said. This exposure can cause important losses to colonies early in the spring. “Colonies do recover from these early losses later in the year. But such losses can negatively impact beekeepers and fruit and vegetable farmers, as they will have fewer bees for crucial pollination services during the summer,” Johnson said. Kill weeds before planting so flowers don’t become exposed and foraging bees are not attracted to fields. Use planters that don’t vent upwards but toward the ground. Johnson said farm equipment manufacturers have started to make these changes in recent years. While insecticide-coated corn seeds can have a negative impact on bees, the relationship between soybeans and these insects is quite different, Johnson said. In another study, Johnson and postdoctoral researcher Chia-Hua Lin looked at the pollen content of honey collected by beekeepers from throughout Ohio over the summer of 2014. They found soybean pollen in 47 percent of the honey. 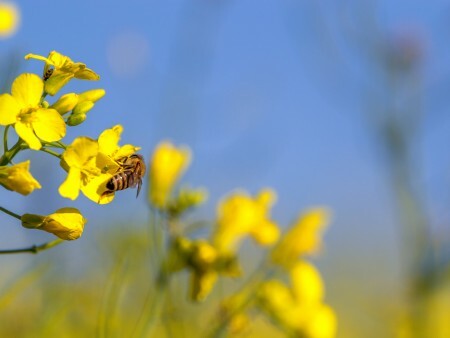 Johnson said there are other questions that remain to be answered on this topic, including which soybean varieties are more attractive to bees and why. To learn more about current pollinator-related research, go to u.osu.edu/beelab.